A figure of a man in armour with his wife are gone. (Presumably he meant worn) It was inscribed ‘ Hie jacent Willms Rokesburgh armiger qui obiit 20 die mensis Anno Dom. 1434 et Isabella Uxor ejus quffi obiit die Anno Dom. 1400 quorum Animabus propieteus Deus.’ It does not appear whether William Rokesburgh lived at Stanstead but most likely he held the manor at the large house near the church known as Stanstead Bury. This mention of William Rokesburgh who died in 1434 and his wife Isabel who died in 1400 are all history books have recorded about these people who are buried at St. James and memorialised there. 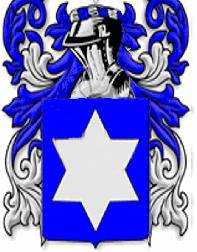 Sir Henry also mentioned two armorial shields, one of the Rokesburgh family arms and another unidentified, presumably representing his wife’s family. There are at least two crests for this ancient Scottish family which are illustrated above. The family motto Tam audax quam fidelis means ‘I am as faithful as I am strong.’ The existence of this brass described in 1700 by Sir Henry Chauncy led me to investigate this unknown couple, who must have lived in Stanstead Abbotts and presumably at Stanstead Bury over 600 years ago. Apart from Chauncy’s mention of the memorial brass, this family are not mentioned in any Hertfordshire history book. The history of the occupation of Stanstead Bury from the 12th century to when the Baesh family took over in the 16th century is a blank page. We know that the manor was owned by the abbot of Waltham Holy Cross as overlord during this period, but we do not know who was lord of the manor or who lived at Stanstead Bury for several centuries, therefore the discovery of the Rokesburgh family was a challenge to help fill in some of this vacuum in our village history. Of course, attempting to research a family of the 14th and early 15th century is more than just a challenge. To me it is a necessity. There were two generations of Rokesburghs at Stanstead, both father and son being called William. 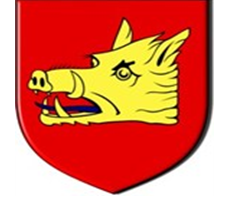 This family name, obviously originated at what is now known as Roxburgh, the county town of Roxburghshire in Scotland. There are mentions of people with this name in the 13th century, e.g. Richard de Rokesburgh initiated as rector of South Kilvington in 1211/12 but by the late 14th century the possessive ‘de’ was being dropped as unnecessary. The earliest mention of the name William Rokesburgh in East Hertfordshire was when his name appeared on a document as witness to a property transaction in 1361, concerning the manor of Landbeach in Cambridgeshire in the name of Sir John de la Lee, who was Steward of the Royal Household under King Edward III, whose seat was at Albury. Hertfordshire. This is a village 5 miles west of Bishop Stortford and near Little Hadham, and Sir John was obviously a neighbouring landowner of our William Rokesburgh. This man remains a shadowy ghost for historians as he does not appear to have held a seat in parliament, as did his son, but he was for a while a government tax collector. (CCR, 1364-8, p.306). We do know that he owned the manors of Stanstead Abbotts and Great Parndon in Essex as he left these two manors to his son when he died. Parndon is today part of Harlow, so the two manors were practically adjoining each other. Apart from information concerning his wife, nothing else is known of William Rokesburgh the Elder as he only appears in history as a signatory on land documents, mainly those of his friends who were neighbouring land-owners. He was obviously an affluent man who had affluent friends and that is all there is to be said about him personally. He died in 1387 and there is no record of his burial. 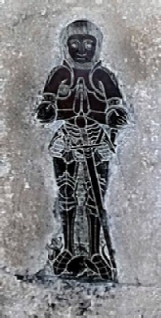 There is, however, a brass memorial plaque in St. James church showing an unknown man in armour but with no apparent inscription. It is recorded as being 15th century armour, but could just as easily be late 14th century? As he obviously lived at Stanstead Bury, it would seem most likely that he was buried there. 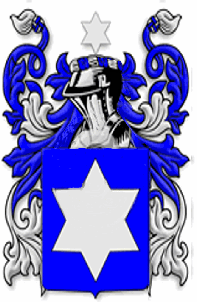 The wife of William Rokesburgh the Elder was named Pernel or Parnel. He was her third husband as she was the widow of John Patmore of Albury and John Barre. It must be remembered that this was the century of the Black Death when the plague was most rampant in the county from anout1349. The resultant death toll obviously accounted for multiple marriages where ladies with affluent husbands needed to maintain their status quo and the estate owners in East Hertfordshire were all familiar with each other. Pernel must have owned the manor of Patmore (part of Albury) from her husband but this had to be relinquished and passed to Sir Walter de la Lee on her death. A document to this effect was dated 20 May 1386 and was signed by Pernel and her husband William de Rokesburgh. (Feet of Fines, CP25/1/90/99 no.79) William had one son, also named William, presumably with Pernel, as no other record of an earlier wife exists. WILLIAM DE ROKESBURGH THE YOUNGER OF STANSTEAD ABBOTTS AND GREAT PARNDON was the son and heir of his father and inherited a large estate covering both sides of the border of Hertfordshire with Essex. He also inherited lands at Thele, Hertfordshire and Whaddon in Cambridgeshire. We know a little more about the son as he did hold several small government posts and was once a Member of Parliament. Fortunately for researchers, all members of parliament are recorded in detail, and although William the Younger was a politician, he was not a very successful one, winning his seat only once in 1421, after several failed attempts. In 1418 he was appointed Commissioner of Sewers in Essex, Hertfordshire & Middlesex, Assessor of a royal loan, April 1431, Kiddles, 1428, 1433, 1434. (This was the right to fish with a net in the River Lea from Ware bridge to the Thames, using a net, either tied to a stake or across a gap in a barrier across the water). He was also appointed Escheator for Essex & Hertfordshire on 5 Nov. 1431, which is probably why his name appears on several land transactions. He was appointed Justice of the Peace for Hertfordshire 1431-33. His parliamentary posts were fairly onerous and in truth he does not appear to have been a very ambitious man, being quite content to live a quiet, un-ambitious life and there is nothing wrong with that. William Rokesburgh of Stanstead Abbotts had many friends in the City, where he appears to have spent much of his time. We may not know much of the man himself, but it is said that a man can be judged by the company he keeps. He would certainly have known Richard Whittington, thrice Lord Mayor of London, and amongst his friends were many other rich city grocer merchants and also the Archbishop of Canterbury. Richard Whittington and Rokesburgh’s friends are recorded as buying the manor of Leadenhall in the City at this time. We know who his friends were as his name is often found as a signatory to their land transactions (various Feet of Fines). The parish of Great Parndon borders Roydon and Nazeing and was comprised of three manors: Gerounds, Katherines and Taylifers. The manor of Gerounds came into the possession of William Rokesburgh the Elder, who in 1383 held a carucate of land there of the Honour of Boulogne. By 1412, William the Youger held land there worth £10 and was one of three men who shared the knight’s fee for the three manors. This was the obligation to the overlord to provide men for military service if required and he did not qualify for the knighthood, owning only one third. (Morant, Essex, ii, 494). Isabel, widow of William Rokesburgh presented there in 1436. (Newport, Reportium, ii, 461/2). William and Isobel (the first) had one daughter, Isobel, who married a John Baud, who died young. It is not known what became of Isobel Baud. In his will, William Rokesburgh left his goods and chattels to his close friend, John Kirkby II of Bishops Hatfield and other friends, including John Barley. It is assumed that his lands were sold off to unknown buyers. And to find these is the next challenge.